On Monday, October 5th, in Spain, at 9 pm Amma meditated, joked, advised, gave some hundreds of people Prasad dinner and danced the Baduga dance to the delight of all. This was a very rare treat for the Spanish devotees and they relished every moment of it. 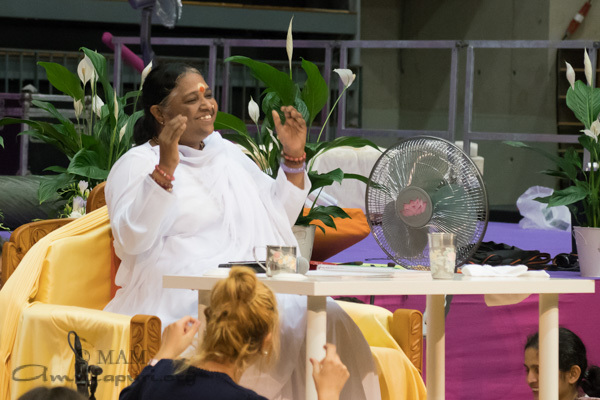 Amma will continue to do this across Europe as often as she can and will resume the same once back at Amritapuri a couple months from now. One can’t help but be amazed by the way Amma can touch and inspire the people of every continent, every culture, race and nationality. How does she do it? She seems to do it by simply being Herself and doing the things she loves to do for people, the unique expression of her pure love and compassion. As usual the enthusiastic Spanish devotees were lined up in the predawn darkness outside the sports palace in Granollers, about an hour from Barcelona. This year volunteers made tea available for them, which was clearly welcome despite the unusually balmy weather. Each country and program has its unique character on the Europe tour. This program gave a peak into the arts of Spain with colourful Flamenco dancers and singers performing in front of Amma as she gave darshan. Young people here are fund of “fusion” music and we were treated to a number of groups that merged local and various Asian traditions to the delight of the listeners. The young people have a very good bhajan group and a focal point of the group is their bhajan player, who is a young man with Down’s Sydrome who has been coming to Amma since he was a little tot. He showed an early interest in the tabla which Amma keenly encouraged and now he doesn’t just pretend to play, he actually does play! We noticed the table devoted to products of the Amma Center in Spain doing a booming business. 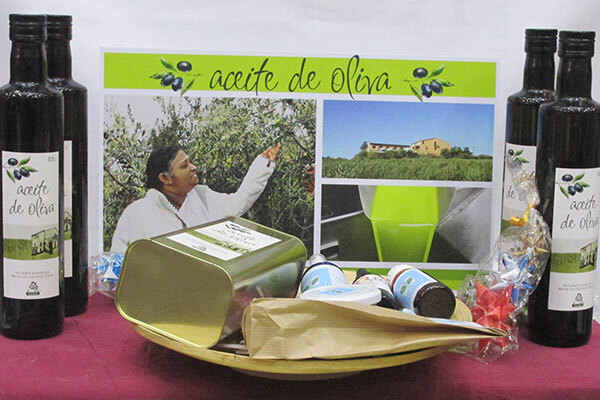 Amma has encouraged all her Centers worldwide to grow organic food and other products and the Spanish Center is unique as it has a large olive orchard. It sells olives and olive oil and we were treated to fresh bread dipped in the olive oil and it was truly outstandingly delicious oil. They also produce herbal tinctures and grow lavender. We tried the tulsi face spray and it was exceptionally refreshing. Mantra and sincerity seem to be paying off in Spain! Clapping is a way that the local people respond to show their approval, appreciation and enthusiasm, whether it is a song, a satsang, a performance or even when Amma comes and goes from the hall. The last morning, as Amma left after Devi Bhava, the people lining her way clapped rhythmically, calling softly, “Amma, Amma, gracias, gracias” (thank you Amma). As the devotees felt sad to see Amma and her group leave, so also did we feel a little sad. It had been a very sweet program and the open hearted, innocent relationship the locals had with Amma and their generosity to the tour group was truly heartwarming. It’s not that we don’t experience this in other places, but it was expressed so openly in Spain, one couldn’t miss it. But it was time to head to Germany, where Amma would make that same heart to heart connection.